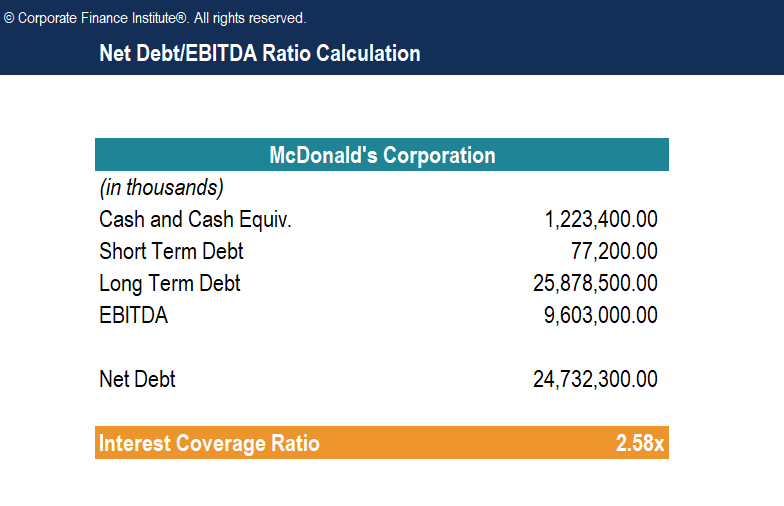 This Net Debt/EBITDA Ratio template will show how to calculate the interest coverage ratio using the formula: (Short Term Debt + Long Term Debt – Cash and Cash Equivalent) / EBITDA. What is the Net Debt to EBITDA Ratio? The net debt to earnings before interest, taxes, depreciation, and amortization (EBITDA) ratio measures financial leverageFinancial LeverageFinancial leverage refers to the amount of borrowed money used to purchase an asset with the expectation that the income from the new asset will exceed the cost of borrowing. In most cases, the provider of the debt will put a limit on how much risk it is ready to take and indicate a limit on the extent of the leverage and a company’s ability to pay off its debtSenior and Subordinated DebtIn order to understand senior and subordinated debt, we must first review the capital stack. Capital stack ranks the priority of different sources of financing. Senior and subordinated debt refer to their rank in a company's capital stack. In the event of a liquidation, senior debt is paid out first. Essentially, the net debt to EBITDA ratio (debt/EBITDA) gives an indication as to how long a company would need to operate at its current level to pay off all its debt. The ratio is commonly used by credit rating agenciesRating AgencyA rating agency is a company that assesses the financial strength of companies and government entities, especially their ability to meet principal and interest payments on their debts. The rating assigned to a given debt shows an agency’s level of confidence that the borrower will honor its debt obligations as agreed. to determine the probability of a company defaulting on its debt. A low ratio of net debt/EBITDA is preferred by analysts as it indicates that the company is not excessively indebted and should be able to repay its debt obligations. Conversely, if the net debt/EBITDA is high, it indicates that a company is heavily burdened with debt. That situation would lower the company’s credit rating and investors would, therefore, require higher yields on bonds to compensate for the higher default risk.